Background: Most preterm births and deaths occur in homes or first-level facilities in low income countries, where gestational age is uncertain. Early identification of premature infants in these settings may improve care-seeking and delivery of interventions to prevent neonatal morbidity and mortality. The objective of this study was to determine the accuracy of different signs of newborn maturity assessed by frontline community health workers (CHWs) to identify the preterm infant. Methodology: We conducted a validation study in a prospective birth cohort in rural Sylhet, Bangladesh. Early pregnancy ultrasonography was performed for gold standard gestational age dating, and newborns were visited at home by a CHW at <72 hours of life. Neonatal assessment included physical/neuromuscular signs and anthropometrics. Sensitivity and specificity of individual signs and different algorithms were calculated. Results: In the live birth cohort (n=727), the mean gold standard gestational age was 38.7(±2.7) weeks and birthweight was 2786g (± 427). The prevalence of preterm birth was 14.0%, low birth weight (LBW<2500g) 16.2%, birth weight <2000g 2.5%. By Ballard scoring, the mean gestational age was 39.4(± 2.1) weeks and preterm birth rate 11.8%. However the sensitivity of the Ballard for detecting preterm births was low (17%). A simple 5 sign assessment (ear recoil, foot creases, breast bud, skin opacity, and foot length) had sensitivity of 75% but low specificity (28%). Foot length <75mm had fair sensitivity for identifying preterm, LBW (75%), and <2000g (83%) babies but lower specificity for all conditions (35-40%). However, the identification of babies <2000g was reasonable with a foot length <74mm (sensitivity 82%, specificity 44%) and head circumference <32.5 cm (sensitivity 89%, specificity 68%). Conclusions: Clinical neonatal assessment of gestational age is challenging in low-resource settings with high rates of fetal growth restriction. Foot length and head circumference may reasonably identify the high-risk “<2000 gm infants” in settings where birth weight is unavailable. 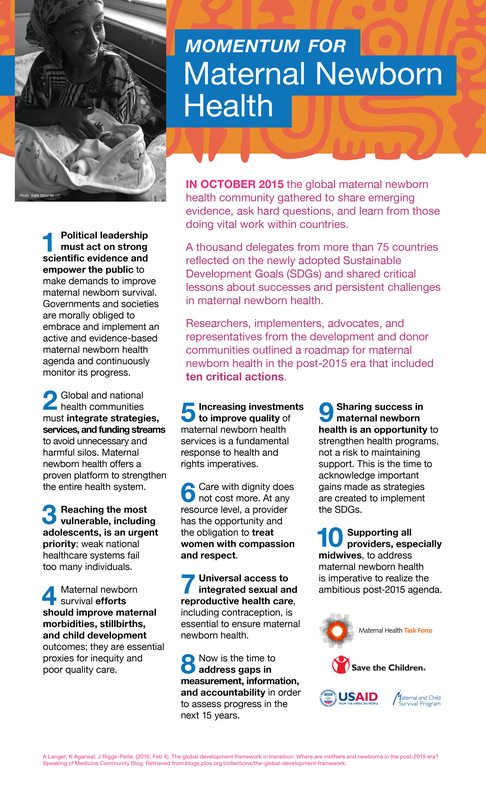 Background: Recent global commitments have affirmed the need to integrate maternal and newborn health to ensure that women and newborns thrive, not just survive. Emergency Obstetric and Newborn Care (EmONC) Assessments provide the depth and scope of facility level information required to make results-oriented decisions to improve maternal and newborn care, but the potential contribution to newborn care improvements has often been overlooked. In recognition of this vital link, neonatal resuscitation was added as an EmOC signal function in 2009, but cross country comparative analyses of newborn care have been missing. Methodology: Utilizing data in the publicly available EmONC assessment reports we analyzed selected variables in common regarding multi-level health system readiness and performance of neonatal resuscitation. EmONC assessments are cross-sectional health facility assessments typically designed to include all hospitals and a sample or restricted census of lower level health facilities, providing a pre-set threshold of delivery services. We identified 25 EmONC assessments across Africa, Asia, Latin America and the Middle East, which were conducted since 2009 and included newborn resuscitation as a signal function. Results: We will present recent performance of the neonatal resuscitation with ambu bag and mask in the context of essential health system supports required to perform neonatal resuscitation. These include the availability, skills and knowledge of health providers, availability of equipment, and other reasons described as barriers to its performance. Conclusion: EmONC assessment data are a rich source for tracking the progress of governments and partners as they strengthen the capacity of health workers and their work environments to provide neonatal resuscitation. Results also point to where efforts should be doubled, particularly health centers, which are often lacking in equipment and trained personnel. The EmONC assessment is an expanding platform to include additional newborn signal functions for both routine delivery as well as emergency care. One-quarter of neonatal deaths are attributable to infections, which may be prevented by maternal handwashing. Handwashing is difficult to increase among mothers in the neonatal period. In a randomized controlled trial, we tested the impact of a chlorhexidine-based waterless hand cleansing promotion on behavior of mothers and other household members. We identified pregnant women at 32-34 weeks gestation and randomized them to intervention or control. Behavior change communicators promoted chlorhexidine hand cleansing to pregnant women and household members in the intervention arm, and provided a bottle of 4% chlorhexidine lotion. Using data from structured observations, we compared hand cleansing with chlorhexidine or handwashing with soap before baby care among mothers and household members in the intervention arm to those in the control. Hand cleansing before baby care was observed 5.6 times more frequently among 130 mothers in the intervention arm, compared to 128 controls (95% CI 4.0 – 7.7). Hand cleansing was observed at 34% of baby care events among women other than the mother in the intervention arm and 3% in the control arm (RR 10.9, 95% CI 5.1 – 23.1). Girls in the intervention arm cleansed hands before baby contact 37.0 times more frequently than those in the control arm (95% CI 5.2 – 263.7). Men cleansed hands before 29% and boys cleansed before 44% of baby care events in the intervention arm, compared to 0% for each in the control arm. A waterless hand cleansing option using chlorhexidine resulted in substantial increases in hand cleansing behavior among mothers who have greatest contact with neonates. Other household members, particularly children who may introduce new organisms to the neonate’s environment, had far greater increases in hand cleansing in the intervention arm than mothers. The impact of chlorhexidine hand cleansing among mothers and other household members on neonatal infections should be evaluated. Background: Safe water, sanitation, and hygiene (WASH) in healthcare facilities (HCFs) play critical roles in infection prevention, especially surrounding childbirth. Despite this, little is known about the status of WASH in HCF in Cambodia. To meet this need, the Center for Global Safe Water (CGSW) at Emory University developed a tool to assess WASH infrastructure and resources in HCFs. Additionally, WaterAid and partners are assessing what data will be necessary to drive facility level improvements in WASH in HCF by the Ministry of Health (MoH). Methodology: The Emory tool utilizes survey data, observations, and water quality indicators and includes modules on water, sanitation, hygiene, infection control, medical waste, wastewater, electricity, and accessibility of WASH resources. The tool will be deployed in ten provincial hospitals in Cambodia by August 2015. In addition, WaterAid with the National Institute of Public Health Cambodia is conducting a review of existing facility assessments and monitoring tools to identify what WASH data are collected routinely by the MoH. These data will help identify where monitoring and assessments could be adapted to drive investment in operation, maintenance and facility upgrades. Results: Pilot data suggest that while hospitals have access to improved water sources, the reliability and availability of water is limited due to power outages, dry seasons, and aging infrastructure. Toilet facilities are rudimentary and access to sanitation and handwashing facilities are limited for patients and caregivers. The assessment forms part of a baseline assessment of HCF in Cambodia that will receive a water treatment system, as well as other WASH-promotion programming, through a grant from the General Electric Foundation. Conclusion: Data from both studies will contribute to the evidence-base for advocacy and action in the areas of WASH, HCF, and improving health outcomes surrounding childbirth. Background: Access to safe drinking water and improved hygiene are important for reducing diarrhea morbidity and mortality. A clinic-based intervention to integrate the distribution of hygiene kits (including safe water storage containers, sodium hypochlorite water treatment solution, soap, ORS, and educational materials) at first antenatal visit, and refills of water treatment solution and soap at follow-up antenatal visits, delivery, and postnatal visits, was implemented in Malawi in 2007. A program evaluation completed 9 months after implementation demonstrated significantly increased use of water treatment solution, improved handwashing technique, and increased use of antenatal, delivery and postnatal services. An assessment of program sustainability was conducted 3 years after implementation. Methodology: The sustainability study surveyed the same group of program participants in 2010, 3 years after program implementation was initiated, about hygiene habits and tested stored drinking water for residual chlorine as an objective confirmation of water treatment. Survey results at follow-up were compared to baseline. Results: Of 389 participants enrolled at baseline, 198 participants were located and surveyed at 3-year follow up to assess current water treatment practices, test drinking water for residual chlorine, and observe handwashing technique. Compared to baseline, a significantly higher percentage of program participants at 3-year follow-up demonstrated knowledge of correct water treatment procedure (67% vs. 36%, p<0.0001), confirmed treatment of drinking water (24% vs. 2%, p<0.0001), reported purchase and confirmed use of water treatment product (21% vs. 1%, p<0.001), and correct handwashing technique (50% vs. 21%, p<0.001). Conclusion: This antenatal clinic-based program appeared to be an effective strategy for promoting sustained water treatment behavior and proper handwashing technique among pregnant women with the potential for impact on household hygiene behavior. Background: There is growing recognition of the importance of water, sanitation and hygiene (WASH) and infection prevention and control (IPC) in healthcare institutions for maternal and newborn health. Research dedicated to exploring these relationships and informing improvements, however, remains comparatively limited. The WASH & CLEAN collaborative study developed new tools to assess WASH and IPC on maternity units and was conducted in Gujarat State, India, and Dhaka Division, Bangladesh in 2013-14. Methodology: A mixed methods approach was adopted. In each maternity unit, a walk-through of the antenatal and postnatal wards and the labour room was undertaken. Observations were made of visual cleanliness and microbiological swabs taken from high-risk touch sites, such as the delivery bed and hand washing facilities. Information was collected on facility resources, infrastructure, and routine IPC practices. Interviews were conducted using ‘photo elicitation’ with a range of stakeholders to explore views and perceptions on the determinants and state of maternity unit hygiene. Results: Both within and between facilities, the determinants and state of hygiene varied, but all had room for improvement. In particular, no clear relationship was found between visual cleanliness and safety as assessed microbiologically through the presence of potential pathogens on touch sites, indicative of “hygiene failures.” Although knowledge of the importance of IPC was common, training was sporadic and some important cadres (ward cleaners or orderlies) were often excluded. Basic infrastructure for hand hygiene and sanitation was poor in some facilities, but for others this was not the case and yet hygiene remained poor, so highlighting human behavioural drivers. Conclusion: Improvements in hygiene on maternity wards are important to the prevention of infections in mothers and newborns. This will become even more important as institutional deliveries increase. In-depth assessments using mixed methods are invaluable for informing and monitoring local and national level action. Background: The links between WASH and child health are well known, and are reflected in programme design. By contrast, recognition of WASH’s importance to MNH is nascent, and the evidence-base remains limited. This presentation contributes to this evidence. Methods: We conducted a far-reaching exploratory literature review to develop a conceptual framework building on existing approaches to WASH-related disease classification, identification of health gender inequalities, and a life-course approach incorporating risk-accumulation and longer-term concerns. We also conducted systematic reviews and secondary-data analyses to explore the association between water and sanitation (WatSan) and maternal mortality, and to describe WatSan for births in home and health-facility environments. Conclusion: Many gaps remain requiring primary research to investigate specific exposure-outcome relationships and systematic reviews of existing evidence on the more dominant pathways. Nevertheless, whilst more evidence is needed, there is sufficient evidence to give greater consideration to WASH in in improving MNH, including in improving WASH in health facilities in the first instance. Background: In Haiti only 36% of births take place in health facilities, putting women at high risk of maternal mortality. One reason for the low use of facility-based delivery care could be the limited availability and poor quality of delivery care provided in health facilities. We applied a geo-spatial methodology to estimate the influence of the obstetric service environment on women’s use of facility delivery care. Methods: Data for the study came from the 2012 Haiti Demographic and Health Survey (DHS) and the 2013 Haiti Service Provision Assessment (HSPA) survey, both of which collected GPS data of clusters or health facilities. We linked each DHS cluster to the SPA facilities within a specified distance (5 km for urban and 10 km for rural). The availability of obstetric care was measured by the number of facilities providing normal delivery care within the specified distance. Service readiness was measured with a range of indicators defined by the WHO. Random-effects logit regressions were used to model the variation in individual use of facility-based delivery care and cluster-level service availability and readiness with adjustments for individual-level factors. Separate analyses were conducted for urban and rural areas. Results: About 42% of rural clusters and 24% of urban clusters were linked to no or only one facility offering delivery care within the specified distance. Urban clusters had access to better service readiness than rural clusters with a wide range of variation in both areas. Multilevel models indicate that in rural areas, both high levels of service availability and service readiness are associated with women’s greater likelihood of use of facility-based delivery care; in urban area, only service readiness was significant. Conclusions: Improving service availability should be prioritized in rural areas. This may imply a need for changing the actual mandate of lower-level facilities to meet the local reality and health needs. In Indonesia, the Maternal and Child Health handbook has been used for 25 years to convey health education information to pregnant and postpartum mothers and families. 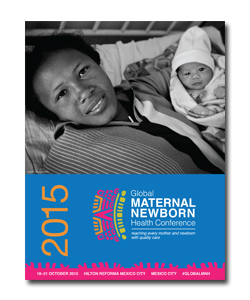 The handbook is distributed at one time during pregnancy, and the mother is encouraged to read it. However, focus group discussion in two districts in Indonesia in 2014 shows that mothers usually forget where they keep it, use it as a fan when the day is hot, or even let the children play with it. SMSBunda is a new approach to convey targeted, health education messages directly to mothers at times when mothers most need the information. The content of the MCH handbook has been “translated” into SMS messages that are sent out at frequent intervals according to the gestational age or age of the newborn. Results from an acceptability study of SMSbunda shows that mothers enjoy receiving messages, all of respondents read the message right away, and information is considered useful. Since SMSbunda was launched in April 2014 to March 2015, 11000 mobile phone registered to this program, and trends show significant increases since September 2014. However, people changing cell phone number frequently and the inability to use SMS technology especially among mothers with lower level of education are challenging the program. Learning from its startup, demonstration, and full roll-out phase, registration for SMSbunda is improving by conducting intensive socialization and promotion, improving content of message, and service extension. Multiple schemes have been identified for program sustainability involving Private sector and Government of Indonesia, concomitant evidence demonstrating positive impact. Background: OpenSRP is an open-source integrated electronic register-based mobile data platform that supports urban and rural community health workers (CHWs) to deliver core interventions along the RMNCH continuum of care. OpenSRP Indonesia, is exploring the potential of mHealth to use real-time data as a catalytic tool for improved performance and job satisfaction of CHWs crucial for continuous quality improvement and sustainability of mHealth approaches. Methodology: In collaboration with the Government of Central Lombok District, Indonesia, we are currently implementing a 6-month trial of OpenSPR with 40 community midwives using a randomized controlled trial design; covering ~5800 pregnant women and their children. We developed indices of usability, quality and proficiency (Head, Heart, Hands Score) regarding the use of the OpenSRP application in the field. These allow routine assessments of provider performance enabling a dynamic process of continuous quality improvement through real time rapid analysis of their individual scores and feedback through coaching and supervision. Results: Initial formative work revealed that CHWs reported their time-management was sub-optimal due to burdensome reporting requirements, lack of decision support tools and rudimentary paper registers. Preliminary results from piloting OpenSRP Indonesia suggests it is able to reduce the reporting workload, prioritise service provision based on risk and improve worker engagement a. A critical piece of improving the CHWs performance and responsiveness and ability to manage their caseloads more effectively is the rapid feedback and customized coaching, and the ability of CHWs to adjust this process to suit their needs. Conclusion: OpenSRP as a mobile data platform and as a rapid data analytics tool, has the potential to increase CHWs quality, coverage and responsiveness to provide vital services to pregnant women and newborns. Our approach of user-centered design and rapid feedback also provides a way of ensuring continuous quality improvement and engagement with CHWs.